Clicking on a product image will open a link to Amazon. All prices current as of 10/01/18. Purchasing through this page supports Yōkai Audio! Outside of the obvious sound quality, there are two main considerations when selecting an interface for podcast recording. Number of inputs – A higher number inputs is important if you want to record multiple people simultaneously in the same room. A digital audio interface with multiple inputs allows you to record a separate signal from each microphone, allowing you to edit each participant’s audio independently of the others. Say you’ve got three people in the room, and person #3 accidentally bumps their mic while person #1 & #2 are talking, causing a large “CLUNK” sound on the recording. With multi-track recording, you can cut out that noise without affecting the sound of #1 & #2’s conversation. You can also adjust levels independently, so if one person is speaking quietly, you can bump up their volume without making the entire conversation louder. The more inputs you can record simultaneously, the more people you can include in the conversation. If you’ve got two hosts and plan on having guests or in-person interviews, you’ll want more than two inputs. Compatibility – Pro Tools is the most popular and common professional Digital Audio Workstation software. Audacity is free and very popular among home users. Having hardware that is compatible with one or both DAW’s makes it easier for you to work with collaborators, whether during or post-production. Given these considerations, I recommend Focusrite Scarlett USB Audio Interfaces. Three recommendations at increasing price and quality. This mic delivers exceptional sound quality at an unbelievably low price point. It has both XLR and USB outputs making it incredibly flexible. A favorite among many podcasters, from beginners to pros. 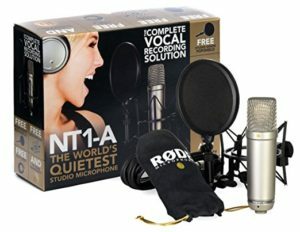 The Røde NT1A is an excellent studio mic. 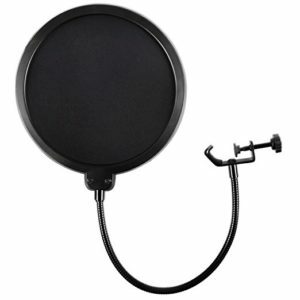 The price includes a shock mount (important for isolating the mic from bumps and room noise) and a pop filter (to get rid of those plosive B and P pops). 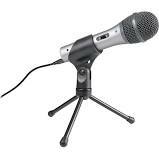 This is one of my favorite mics and is in use in professional recording studios worldwide. The Shins’ breakthrough album Chutes Too Narrow was recorded almost entirely with a Røde NT1A. Since the Røde is a condenser mic, it requires phantom power which is provided by either of the above Focusrite interfaces. 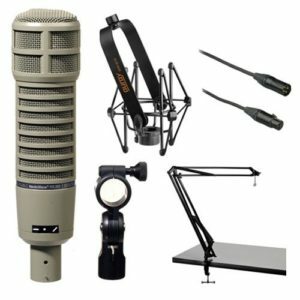 The Electro Voice RE20 is the gold standard in broadcast radio microphones and a much-loved studio workhorse. It does everything well. You’d be hard pressed to find a better mic at any price. The kit includes a shock mount and an easily adjustable arm for mounting to a desk or table. Well worth the extra $50. I highly recommend using a boom stand for microphone placement, rather than using a small stand on a table. Tables transmit noise, whether it’s people picking up and setting down glasses, bumping table legs, vibration from appliances or even street traffic. A good boom mic stand and shock mount will help keep your signal nice and clean while allowing you to get that mic exactly where it needs to be. Remember, boom stands can tip over and cause damage to your microphone, so make sure you’re careful to balance the boom correctly. Long experience has taught me that you get what you pay for when it comes to microphone stands. The joint between the vertical and horizontal tubes on boom stands seems particularly prone to failure. This stand reviews pretty well. Bargain stands can last a long time if you treat them well. 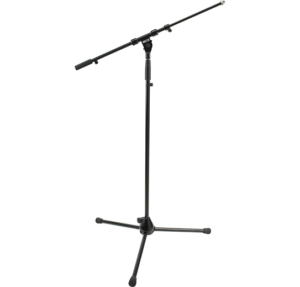 A rock solid stand that is easy to adjust and will last through years and years of hard use. This link goes to Guitar Center, as Amazon doesn’t have a professional quality offering. 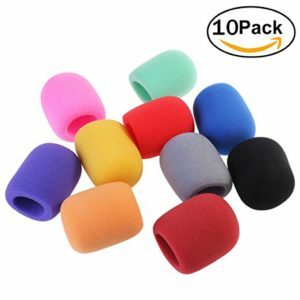 An inexpensive way to knock out plosive noise, the popping sound you get from B’s and P’s. Windscreens are even cheaper and less fragile, but don’t work quite as well. Windscreens are available in a variety of sizes and fit over the end of the microphone like a sock. The more expensive mics above come with shockmounts, but the ATR2100 does not. 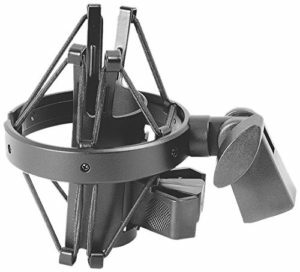 A shockmount suspends the microphone using rubber bands to isolate the mic from noise transmitted through the mic stand. This shockmount will fit the ATR2100. 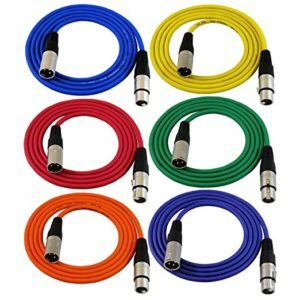 I included these because the multicolored cables will help you keep everything straight when it’s all plugged in, which can make troubleshooting much faster. When things go wrong (and they will), being able to quickly identify what’s plugged in where is a big help. Make sure you’ve got enough length on your cables that they’re not creating a tripping hazard or pulling your equipment over.